I recently watched the Netflix documentary series “Cooked” (http://michaelpollan.com/videos/netflix-documentary-series-cooked/). It’s a remarkably good series, and I strongly recommend it. In it, Chef Michael Pollan spends a significant amount of time on the topic of bread making. One of the points that is made is that the fundamentals of bread have changed significantly since the early 1900s … arguably for the first time since bread was invented by the ancient Egyptians. Specifically, the introductions of white flour and commercial fast-rising yeasts has radically changed the state of the art. The effect has been a reduction in the naturally present nutrition contained in the flour, as well as a reduction in the nutrition and flavor that comes from a slower fermentation process. Yes, it turns out. Yeast, the stuff you put into your brew bucket to make you a good beer, causes fermentation. Yeast is also the stuff that makes your bread rise; the bubbles in your slice of bread are the result of CO2 released by fermentation. Ever hear of a “one hour beer”? Me neither. Yet, we do have “one hour bread”. However, it would seem that bread and beer are technically at least distant cousins; grains, yeasts, sugars, water, and fermentation over time. By the time I was done watching the show, and letting all the implications rattle around in the back of my head for a couple of days, I had to give it a try. Now, for perspective, I’ve never made bread before. Ever. My first bread-making project? “Air-start” whole-wheat sourdough using unpasteurized honey to provide the extra sugars. The first step is the creation of your “starter culture”. Essentially, you create a biological reserve of active yeasts living in a healthy environment, and then press “PAUSE” on that environment. When you want to make a couple of loaves of bread you scoop a cup of material out, replacing it with more flour and water. 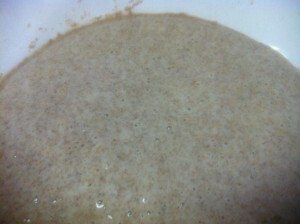 This extracted material contains everything required to trigger the “bread making” process in virgin material that you add it to, and later bake. Add flour, and mix thoroughly. You should wind up with a mixture that is thinner in consistency than dough. It should seem like a thick paste. 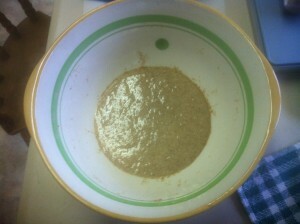 Leave exposed to the air for 15 minutes, and then cover the mixing bowl with a tea-towel. Place somewhere warm where it will not be disturbed; you want to keep the bowl at room temperature (20C / 68F). One of the things I noticed about this is that it smells. Not strong, or unpleasant, but noticeable. To me it was almost a sweet vinegar smell, or like a harsh beer. My morning routine before heading to the office was “feeding” the nascent Starter mixture, and enjoying the smell of the results. Bubbles should be obviously present by day 3 of this process. That’s your visual queue that yeast has taken up residence and has gotten to the job of transforming the raw materials you’ve provided into the basis of a good bread. This entry was posted in 21c Homestead, Cooking & Baking and tagged Bread Making by MichelV69. Bookmark the permalink.